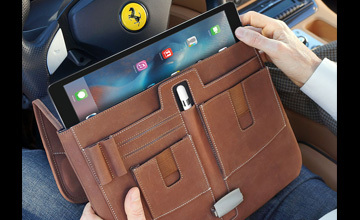 CARLSBAD, CA, UNITED STATES, April 9, 2019 /EINPresswire.com/ -- MacCase, the creators of the Apple-specific case market, launched their new Premium Leather iPad Briefcase for Apple’s 12.9 tablet. The new model works with all 3 generations of the 12.9 iPad Pro. The horizontal leather briefcase is part of MacCase’s Premium Leather Collection. It is designed for working professionals looking to go as “paperless” as possible and who want to downsize from a bulky, burdensome briefcase they might be currently carrying. The Premium Leather iPad Briefcase works holistically with the iPad Pro to allow the user to create a mobile office in a compact, lightweight, elegant package. The handcrafted leather iPad case offers an alternative to both nylon and traditionally cumbersome leather briefcases. With its minimalist half-inch width, the innovative design cuts a sleek profile making it easy to maneuver in crowded places. The briefcase is available in a classic, pebble grain satin black hide as well as the company’s hallmark color, an authentic, distressed, warm “vintage” brown. While designed for the 12.9 iPad Pro and the Apple keyboard cover, the new tablet briefcase can be used with any laptop or tablet up to 13.3”. The ultra thin iPad Briefcase is extremely protective, benefiting from MacCase’s two decades of designing and engineering the best in Apple portable protection. Despite the sleek appearance, there is plenty of storage space. Most notably is the unique, vertical, under-flap pocket to store the Apple pencil or similar stylist. The integrated slot provides industry-leading protection for the $130 iPad accessory. There are several large pockets carrying documents and an under-flap organizer for the AC adapter and it’s cable. There is also a place for pens and business cards. The case includes a shoulder strap. A matching shoulder pad and iPhone slipcase are optional. “So many of our customers are professional people. They’re business owners and entrepreneurs. They’re involved in a broad range of fields like the arts, finance, science, real estate, medicine and academia. They make things happen. And they travel a lot. They care about quality and design. They’re tired of buying case after substandard case. When you’re about to give what could be a life changing presentation and you’re wearing your best suit, do you really want to pull your $1200 iPad out of a down-market $50 case? The MacCase Premium Leather iPad Briefcase is the link between the technology you use to tell your story and the clothes and accessories you use to represent who you are,” explained Michael Santoro, President and Chief Creative Officer of MacCase. In 2007 MacCase launched the Premium Leather Collection and re-invented the Apple-specific case market they had created a decade earlier. The iPad Briefcase follows in the long tradition of MacCase creating beautiful, highly protective designs to protect Apple portables. Each piece is meticulously handcrafted to the highest standards. The MSRP is $249.95 and can be seen here: http://www.mac-case.com/collections/leather-briefcases-s/products/leather-ipad-pro-briefcase. "As iPad use becomes more and more ubiquitous, professionals are looking for cases that not only work to protect their technology investment, but meet their needs on a much deeper level. The Premium Leather iPad Briefcase provides a sublime combination of artful aesthetics, world-class build quality and exemplary functionality. It’s a case people will be proud to own," said Santoro. MacCase invented the Apple-specific case market in 1998. The company offers two distinct products lines, one in nylon and one in leather that consists of a broad range of innovative cases, messenger bags, sleeves, folios and backpacks for Apple MacBook Pro and iPad models. MacCase products can be found at Ebags.com, B&H Photo & Video, Walmart.com, UnbeatableSale, Viomart, Other World Computing and MacMall. MacCase products can also be purchased directly from www.mac-case.com.